This is a simple and healthy curry. This goes good with any rice and roti. This can also be given as finger food to babies between 10 to 12 months of age. Dry roast the above two ingredients and finely powder along with salt in a small mixture jar. The spice powder can be prepared in large quantity and stored in an air-tight container for future use. 1. Clean the cut florets of cauliflower in warm water. 2. Cook cauliflower and peas separately with a pinch of salt till they became tender. 3. In a pan, add ghee or oil, add the spice powder. 4. Now, add cauliflower and peas. Mix well so that the vegetables are well coated with the spice powder. 5. Medium the flame. Cover the pan with a lid and leave it as such for ten minutes. 6. Serve as a side dish for Sambar Sadam, Kuzhambu Sadam, Rasam Sadam and Indian Bread. 1. This is a best baby finger food. While preparing this for babies, use minimum quantity of spice powder. Along with this, Colourful Mini Dosas make their way to "Healthy Food for Healthy Kids - Finger Food", guest hosted @ Ruchika cooks, an event started Me. Absolutely healthy curry with minimum spices... We prepare just all with black pepper and salt during the fast. 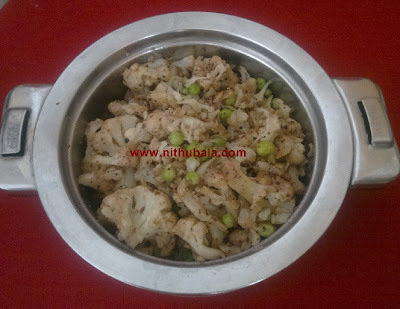 Very healthy and yummy cauliflower fry. hello chitthi!what a wonderful recipe!sure mom would try this out.yummmm! lovely recipe....i am sure kids will love this kind of finger food....nice recipe....easy and quick one..